With some light snow falling last night and a forecast for clear skies brought about an opportunity for a winter traverse. This hike allows some superb views from Mt. Hinodeyama 日の出山 and includes the largely remote and picturesque Konpira Ridge 金比羅尾根. The hike commences 1.5 km from Musashi Itsukaichi Station 武蔵五日市駅. To get to the trail head – exit the station, turn right on Highway 33 and make another right turn at the Shell gas stand, continue on the road behind Itsukaichi Junior School and look for a house nearby with prominent signs pointing towards Mt. Hinodeyama and Mt. Mitakesan. 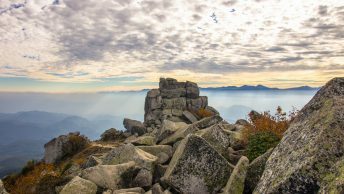 The first part of the walk transports you up to the Kompirajinja Shrine (468 m) with a good view overlooking Itsukaichi City from there the trail follows the Konpira Ridge on towards Mt. Asoyama 麻生山 (794 m) and finally Mt. Hinodeyama 日の出山 (902 m). With the overnight snow some parts of the trail had a fair covering and caution was needed to navigate some sections. The trail has a rather benign slope with only a smattering of steep climbs to negotiate allowing you to maintain a comfortable walking pace. Being both the middle of winter and mid-week meant no hikers were sighted until reaching Mt. Hinodeyama which provided some much needed diversion from congested trains and those that inhabit them. There is a small shelter at the top though doesn’t provide much protection from the icy winds. A after a short lunch stop it was a leisurely walk 3 km walk across to Mt. Mitake and on to the Mitake Tozan Cable 御岳登山ケーブル. Deciding my legs had the better of me I hopped on for the 6 minute trip to Takimoto Village. The other popular option is to walk to Kori Station (two stations from Mitake) which takes 1hr 40mins. The final push to Mitake Station (2.8 km) follows the rather tranquil Osawagawa Creek but unfortunately requires walking along the road. Turning right onto Highway 45 brings you back to the station. Just made the trip from Musashi-Itsukaichi up to Mt. Hinode today and it was gorgeous! Thank you so much for posting the detailed directions. I decided to head down to Tsurutsuru onsen (http://www.gws.ne.jp/home/onsen/) for a dip in the hotsprings after making it to the top of Mt. Hinode. Highly recommended for those who enjoy a good soak, the outdoor bath was very nice! The onsen runs an hourly bus back down to Musashi-Itsukaichi station, so it’s a nice way to get back to the train if you don’t opt to head up to Mitake station. Pleased to hear you enjoyed the hike and hopefully the Golden Week foot traffic wasn’t too bad today. That onsen you mention sounds pretty good and like the fact they run buses directly back to the station. Good hike! Thank you for this website. The maps were extremely helpful. I used them to highlight my own printed maps from Google Maps, which leads to the next question… Is there a way to print these maps? Sadly my cell phone reception was mostly no signal during the hike. I just did the hike today (9/4/2016). The trail is in really good condition with the exception of a few minor trouble spots to note. There is a spot with some serious vegatation covering the trail for about 40 m. I was ready to turn back but got around the bend and all was good. Also, the start of the ascent to Mt. Hinode has noticeable erosion and the wood framed steps are pretty useless. Sadly, Mitake Temple is under renovation at the moment and is covered with nets and scaffolding. Bet it will good once they paint it to it’s former glory. I also took the cable train down and got luckly and caught the bus to Mitake Station. Thanks Stephen you’re most welcome. Good question regarding the Google maps. The short answer is no they can’t be easily printed aside from zooming in and printing up each segment individually, which I’d imagine would be tedious. Given that cell phone reception in the mountains is often patchy I would recommend getting hold of the relevant Yama-to-Kogen map which is listed under each hike. Its been several years now since completing this hike and as trail conditions frequently change the latest maps will hopefully steer you away from any trouble spots. Anyway thanks again for taking the time to comment on the trail conditions.